OK, here we go again, breaking rules. This is a blog supposed to forward early photo documentation of the use and abuse of those pre WWII US made cicles we all love and care for. But I love old photos showing periodic workshop interiors hence this photo with no American cicles in it (the car is US Ford A, or not?). This is a photo filled with details such as periodic advertising, oil cans, toolbench, workers, the lot. It must be Sweden this. As always a great picture, I recall the suspenders coveralls my grandfather used to wear, workdays as well as weekends on the presumable shop owner. 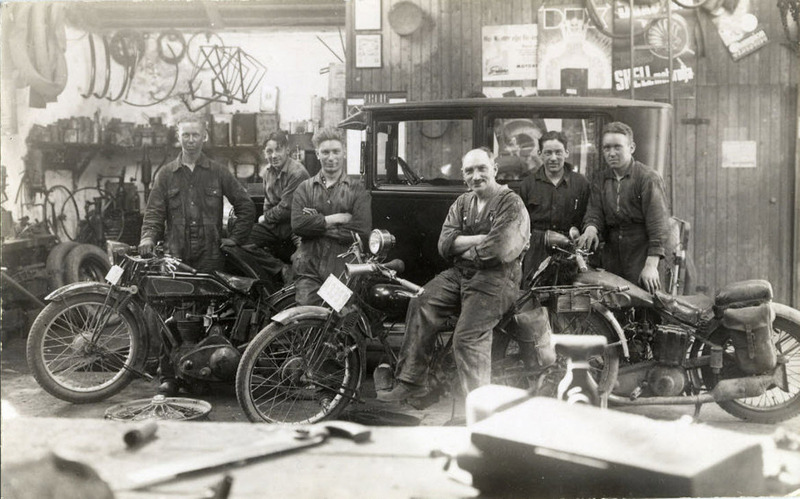 Some number of young apprentices or grease monkeys in such a small shop, you wont see that today. In the background it looks like a T Ford I think but the bikes I cant identify. I cant see the reg.plate, but the first letter there should give the municipaly or is it county its called in English. I can see a couple of Shell motor oil ads, Dux soap and Champion spark plug and it must be a car ad on the wall. Hi Charlie, indeed Sweden. I like your term "grease monkeys", had heard this before a long time ago, glad you reminded me. These guys seems to have had a wide span in what they worked with, from bicycles to cars. Not to many such workshops around today.